Pop! goes Daryl Dixon! Daryl Dixon is back in Pop! vinyl form! The fan-favorite character from AMC’s The Walking Dead , is wielding his rocket launcher from the memorable season 6 mid-season premiere. The Walking Dead Daryl Dixon with Rocket Launcher Pop! Vinyl Figure comes packaged in a window display box and measures approximately 3 3/4-inches tall. Ages 17 and up. Funko,Walking Dead,Pop! Vinyl Figures,Pop! goes Daryl Dixon! 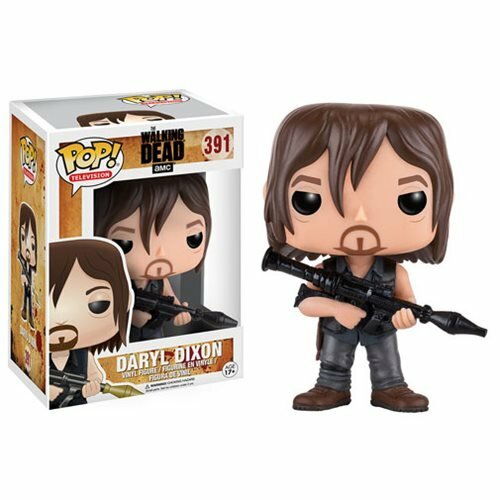 Daryl Dixon is back in Pop! vinyl form! The fan-favorite character from AMC’s The Walking Dead , is wielding his rocket launcher from the memorable season 6 mid-season premiere.